There was a woman on the radio the other day who has just written a book entitled “Why Your Five-Year-Old Could Not Have Done That”. She is an advocate of the gallery system as an effective means of bringing worthwhile pieces of art to the attention of the public. She made the point that it is people in the know, the artistic community, people who have studied art, curators etc. who decide what makes it into galleries in the first place. So, a filter has already been applied before what we would call “the public” get to see it. 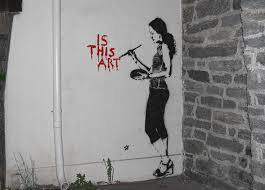 Which of course begs the eternal question; what is art and more pertinently who decides? The same scenario applies when it comes to fashion. You’ve often heard it said of someone that they have style or taste based on the clothes that they wear. Clothes that were inevitably purchased in a shop. Clothes that were chosen for that shop by a buyer in an office in London or New York or Paris. At least one filter has already been applied. I wrote a poem yesterday on the back of my bus ticket about a chicken that survives the nuclear holocaust. It will never be published so by our friend’s logic it is not art any more, it ceases to be art when it doesn’t attract an audience. According to her, any Ed Sheeran song you care to choose has more artistic merit than post-apocalyptic poultry poetry. Say it ain’t so. Speaking of art, there I was looking through our fairly extensive library of family photographs and noticing the number of randoms dotted throughout the collection. Randoms of course being innocent bystanders, entirely unconnected strangers who just happened to be in the shot, in the background mostly, unwittingly captured in the crosshairs. And you would have to lament the fact that these randoms simply do not know the pivotal role they occupy in the compendium of our collective memory. Because some of these are nice shots, ones you go back to again and again; and with each visit there is the random commanding his or her slice of the spotlight. In particularly wistful moments you might wonder about their name, where they live, how many kids they might have, what line of work they might be in. Think how nice it would be to let them know how important they have become over the years, how they’ve soldered themselves to your collective identity, become subsumed within the family mythology, how you’ve warmed to them and indeed look forward to their unchanging, reassuring image. There is a lot you can deduce from the photo, but wouldn’t it be great to get an update? I mean, what are they doing right now, where are they doing it, what if they’re dead? Not so much closure as full disclosure. Enter randomsreunited.com. The site would operate on the same principle as lost dog or cat websites. Post the photo with a few details surrounding the circumstances of the shot and wait for the randoms to come to you. Let’s face it these people are already part of the family so why not bring them in from the cold? Who knows the possibilities once the ice is broken, you might have more in common than you imagine. After all, there’s probably a good reason you were only a few feet away from each other for that landmark moment all those years ago. You probably share the same values and outlook on life. I mean, what can possibly go wrong?